Try these two pretty Scandinavian inspired Valentine’s cards to give your loved one a heartfelt message this year. Who wouldn’t love being given a handmade Valentine’s card? See below for how to make each card in just a few easy steps. 1. Enlarge the card template (above) on a photocopier to 200%. Trace off the separate shapes and cut out, using the photograph as a guide to which papers to use for the relevant shapes. Cut a scalloped line on two adjacent sides of both light blue squares, along the cut-off corner of both patterned squares, and around the large white heart. 2. Lightly score the white card rectangle along the centre line and fold in half to make a square greetings card. Glue the paper squares to the front of the card and conceal the joins using rickrack braid. 3. Glue the red heart to the centre of the white heart and write the word “love” all around it. Tie a length of embroidery cotton to the button and glue it to the heart. 4. Referring to the template below, attach the heart to the card, using adhesive mounts. Use the space inside the card to write your special greetings message. 1. Enlarge the card template (above) on a photocopier to 200%. Trace off the separate shapes and cut out, using the photo as a guide to which papers to use for each relevant shape. 2. Lightly score the card rectangle lengthways along the centre line and fold in half to make a greetings card that opens at the lower edge. Stick the red spotted oval to the front of the card and draw the decorations and “stitching” line around it with fine-liner pens. 3. Referring to the photo, glue the letters to the cream oval and draw on the line of “stitching”. Attach the rickrack braid to the reverse of the pink oval, so that the curves peek out around the edge. Glue the cream oval centrally on to the pink oval. 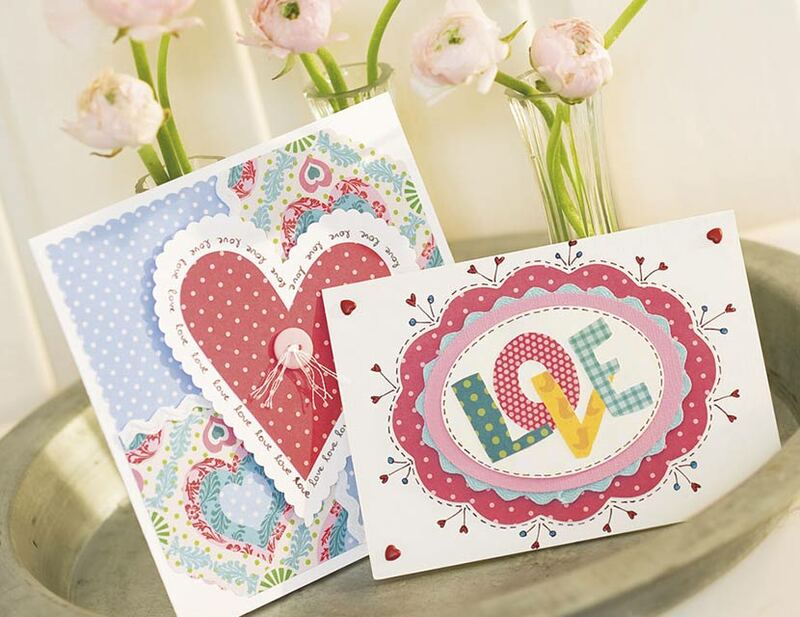 These homemade Valentine’s cards were taken from Scandinavian Designs In Red And White by Nadja Knab-Leers, Heike Roland and Stefanie Thomas is £9.99, published by Search Press.